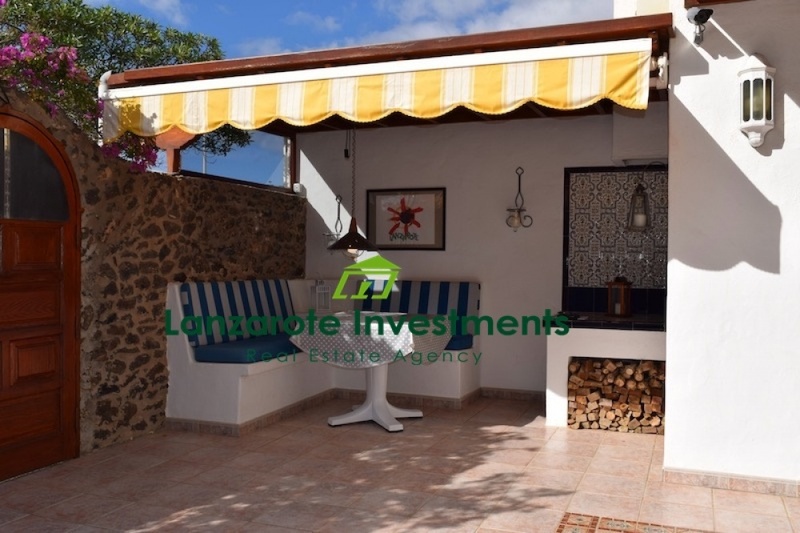 This charming semi-detached villa is situated in a quiet and perfectly maintained residential urbanization in Playa Blanca, only a 10 minutes’ walk away from the centre of town with its beaches, bars, restaurants and shopping facilities. The warmly designed and very well maintained villa consists of lounge with a fire place and dining area, 2 bedrooms, 2 bathrooms, kitchen and a utility room. The terrace has views to the mountains and is surrounded by a volcanic wall with mature plants, offering privacy for sun bathing. Also on the terrace there is a nice dining area with a built in barbecue and storage facilities. The community has a tennis court, a large heated swimming pool and a smaller children’s pool surrounded by a large tiled sun deck. The communal gardens are generous and well maintained. To be sold fully furnished.